Mounds of trash. Countless dirty diapers. A dead dog lying on a mattress, feces smeared on the ceilings and, perhaps most heartbreaking, the handprint of a baby on a wall. 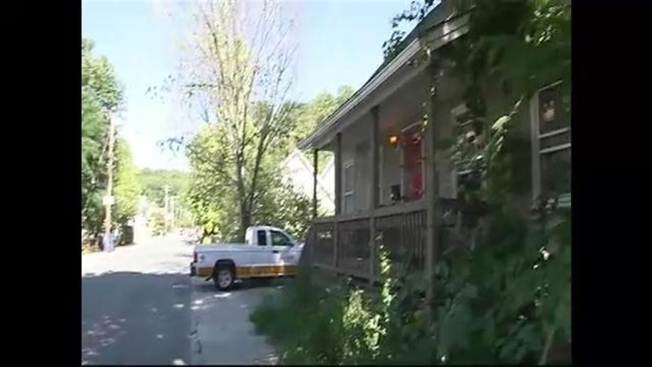 NECN got an exclusive first look inside the now-demolished Blackstone, Massachusetts, house of squalor four children were rescued from in August, with just-released video and photos. Erika Murray, 31, was believed to have been living in the St. Paul Street home with her children, where police also found the bodies of three infants hidden in a closet. The video is rough, shot by town officials using flashlights to see. First a man's voice can be heard off-camera: "First time in, I saw him, and I thought he was going to faint." Then the filth and squalor are revealed. "You were taken over by the smell. That was it. That's what still lingers," Blackstone's town administrator Daniel Keyes said. "Just debris, hoarding," Keyes said. "You had four dead animals, three dead children and people living there. Terrible." Keyes was one of the few people to don a hazmat suit and go inside to document what was there before the house was condemned and torn down. "It was horrific," he said of the scene inside. "It was unbelievable — something beyond comprehension." Photographs show a disturbing scene of squalor, beyond the piles of trash, diapers and feces. The filthy mattresses had no linens; the bathtub was filled with trash and clothes. The garbage reached as high as the ceiling in some places, Keyes said. "Those young children had to go through that," Keyes said. "To think that they had to live in those conditions, it’s jus unbearable." Amid the squalor, the photos reveal heartbreaking reminders that children lived there. Holiday dresses hang neatly in a closet. Toddlers' games poke through the debris. A Tinkerbell suitcase sits cheerily askew atop a mountain of trash. But it is another image that will haunt Keyes: a baby's handprint. "Upstairs in the bedroom, the smell and just the sight of the walls, the feces on the walls — the handprint of a little baby," he said. "That has been with me and will probably live with me forever." The squalor in the house was discovered in August, when Murray’s filthy 10-year-old son went to a neighbor, saying that he couldn’t get his 5-month-old sister to stop crying. The neighbor followed the boy back to the house and uncovered the horrifying conditions. The boy, the baby, a 3-year old toddler and a 13-year-old girl were removed from the home and placed in protective custody. Police found the bodies of the infants a week later, in bags hanging in a bedroom closet, wearing diapers and dressed in onesies. Prosecutors say at least two of them lived for a time. Murray is in jail and has pleaded not guilty to, among other things, fetal death concealment and child endangerment charges. Her attorney says she is mentally ill. Her criminal case has been put on hold until the state medical examiner can finish autopsies in the infants' remains. Murray is due back in court Jan. 14. Her boyfriend, who claims he stayed mostly in the basement, is out on bail on drug possession charges.